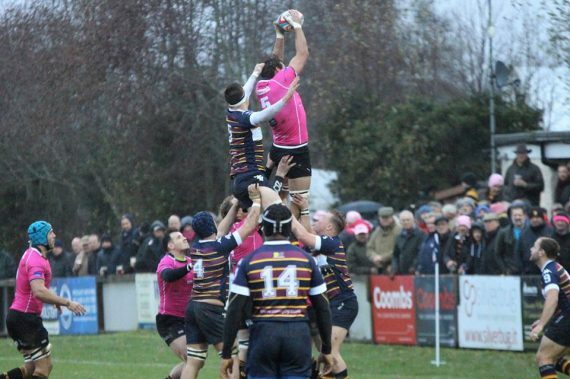 Canterbury were well and truly in the pink as they marched to a sixth straight win at a wet and windy Marine Travel ground. Playing into the gale they put the result almost beyond doubt with a superb first half performance which built a seventeen point lead. The team may have looked different in pink shirts, worn to support the club’s cancer charity day, but they came up with something now more familiar – a five point bonus victory. It kept the city side in second place in the league table and although they went off script a little in the second half they are establishing themselves as the team to beat in National 2 South. Old Albanian made a contest of it after the break, helped by Canterbury’s failure to control possession the way they had earlier, but it was all over long before the second of their two scores came in stoppage time. A lapse in the visiting defence gave the city side their first chance after fourteen minutes. Dan Smart spotted the hole and sent Charlie Grimes on his way. The wing was caught just short of the posts but Canterbury won a penalty and an effective lineout drive brought a try for Sam Kenny. With Albanians unable to get hold of the ball they were forced on to the back foot and their frustrations ended in a yellow card for former Canterbury junior Charlie Watson. They paid heavily for his ten minutes in the sin bin as the city side grabbed another two tries. Sam Sterling got the first, taking an inside pass to crown a series of close quarter probes. The second was the highlight of a grey afternoon. 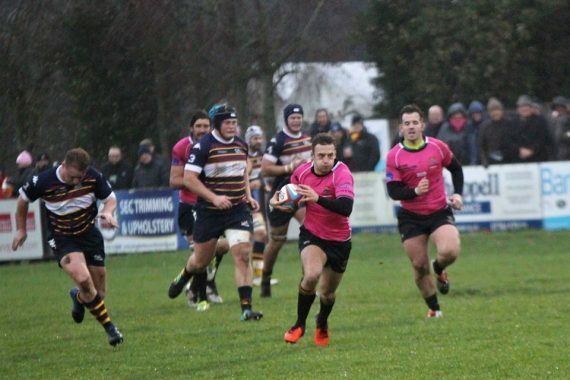 Ricky Mackintosh collected a clearance on half way, spotted space on the outside and sent full back Aiden Moss sprinting home from 40 metres, stepping past a defender in the in-goal area to leave Ollie Best an easy conversion. Albanians prospects became bleaker when they failed to make the most of limited chances. Two attacking line outs were wasted but they brought a new purpose to their game after interval and looked like the side their top six league position suggested. 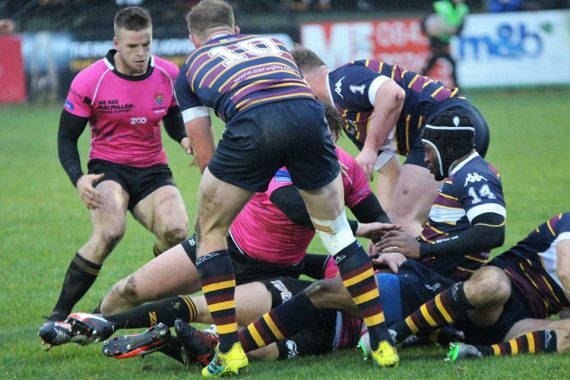 Winning more possession, as Canterbury kicked ball away and conceded penalties, the visitors were rewarded with a try by Number Eight Chris West, converted by Dan Watt. But the city defence was in no mood to concede and when they regained some momentum in the final quarter Royce Cadman crashed over and Best converted. There was late pressure from Albanians after Jim Green was yellow carded but Alex Chalcraft’s debatable, last minute try was all they could manage. Canterbury: A.Moss, R.Mackintosh (repl J.Murray). S.Sterling, T.Best, C.Grimes, O.Best, D.Smart (repl K.Braithwaite), A.Cooper, T.King (repl F.Edwards) S.Kenny (repl J.Green), R.Cadman, M.Corker, L.Whetton (repl J.Otto), S.Stapleton, J.Stephens. This entry was posted	on Saturday, December 1st, 2018 at 4:45 pm	and is filed under Featured, Other Sports, Rugby. You can follow any responses to this entry through the RSS 2.0 feed. Both comments and pings are currently closed.